Along with 11 million others, I dived into reading this weekend. 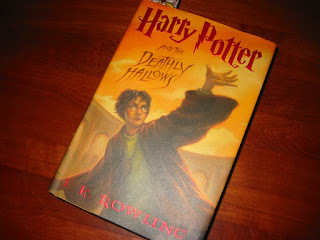 I pre-ordered my copy of Harry Potter and the Deathly Hallows and it was waiting for me when we got back from vacation. I read it over the weekend, staying up far too late, and reading at every opportunity. No spoilers here* but I thoroughly enjoyed it. * Gill and I used to watch Ally McBeal, although the series broadcasts were out of sync between the UK and USA. Once talking about where the action was up to I asked her "Have you got to the one where Billy dies yet?" which of course she had not! This phrase has become a generic in our dialog where there might be a spoiler in a book, or film. I did get some knitting done on holiday, but in keeping with the vacation spirit, it was all simple mindless stuff. 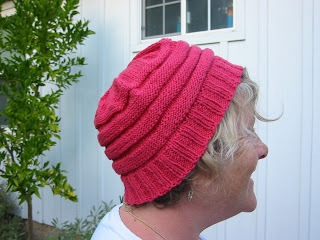 I've been knitting some hats for a friend of Chris's who is undergoing chemotherapy. This is knitted in Calmer, donated by Christina. I had been planning to knit Shedir from Knitty, but could not get gauge, so after a couple of attempts I cast on and knitted my own pattern. This pattern was in a Vogue Knitting magazine, and most conveniently could be knitted from 100 yards of yarn, in this case Noro Silk Garden. I knitted the same pattern for myself from some Malabrigo yarn I bought a while ago. 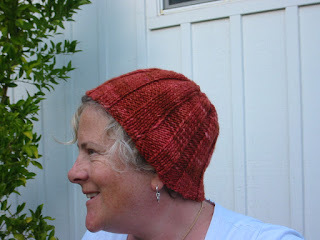 The yardage on the Malabrigo is terrific so I had enough left over to knit this basic roll-brim hat from my own pattern. Noticing the resemblance of my new hats to a tea cosy, I also knitted a tea cosy for when we go camping...our tea always goes cold before we finish the pot when we are in the redwoods...no more! 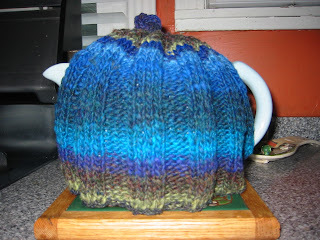 Writing this post reminded me that when I was at school I had a club called The Teacosies, named after our hats...apparently little changes here at Ferretworld. Posting the pictures for the post made me realize that I look more like Jimmy_Hill than ever (except for the beard of course)! Ferretworld just returned from it's summer holiday in Ventura, Southern California. 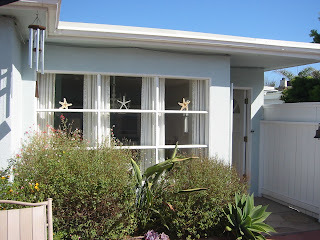 We stayed in this cottage in the Pierpont Beach lane area. It was about 100 yards from the beach. 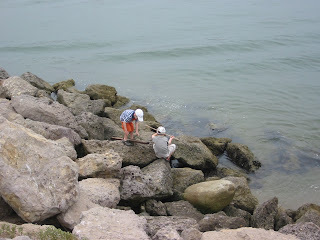 Both boys were fascinated by the crabs along the breakwaters. 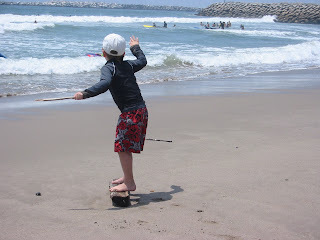 We went each day to check on them and they were thrilled to watch this boy trying to catch them. 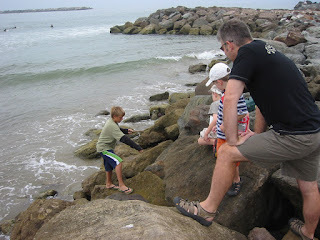 Of course the following day they spent a lot of time trying to catch the crabs themselves. Luckily for me, they were unsuccessful. 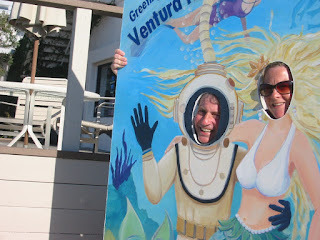 A highlight of our week away was a trip to Channel Islands National Park. 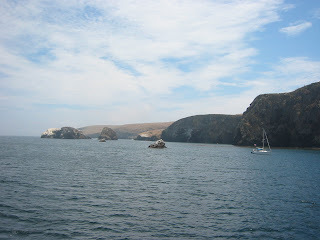 We went to Santa Cruz island which is about 20 miles offshore. The main interest is that the entire area is a marine preserve rich in wildlife and our boat trip allowed us an excellent chance to see some of it. 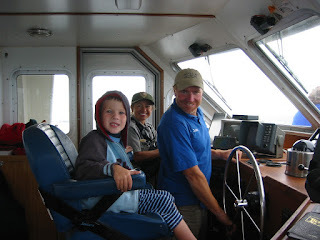 We saw a minke whale and two blue whales. 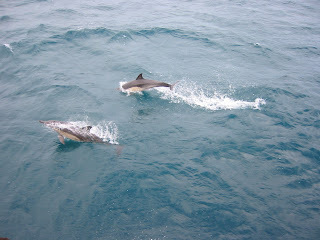 We also saw hundreds of dolphins. Apart from the Channel Islands trip we mostly spent our week on the beach. 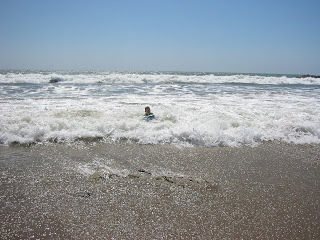 The water is warm in comparison with the Pacific in Northern California, and even I got into the water. The boogie boards got a good workout. 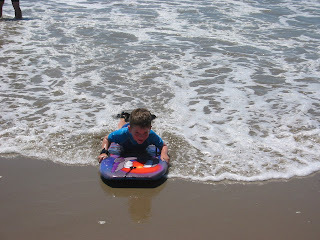 By the end of the week Finlay was on the boogie board too, and saving his money for his own board. My knitting bag was admired at the Knitting Meetup on Wednesday. 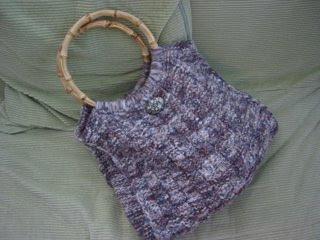 It was knitted for me by Christina and the free pattern is available from her website . I cannot vouch for the pattern since I didnt knit it myself, but I can vouch for the bag - its the perfect size, and in this case, beautifully knitted. 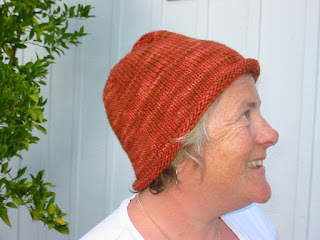 Go and check out her other Pattern of the Month patterns. 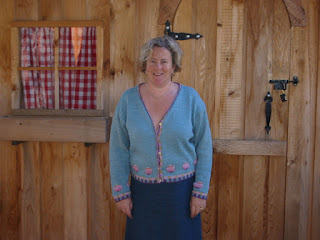 I finished the Chinese Lanterns cardigan....and it only took me 15 years! The pattern is Chinese Lanterns by Kaffe Fassett from Rowan 19. Knitted in Cotton Glace as prescribed. Modifications? I didn't knit the lanterns! Well, at least I didnt knit them all. Its already a pretty dated cardigan with the drop sleeves so i'm pretty glad that 15 years ago i was too lazy to knit the body with it's full complement of lanterns all over. I can't imagine that I will wear it much, although the cotton knits up into a really nice weight. And also, I need to sew up the buttonholes. I finished the Monkey socks. They are so soft and squishy, and I'm really pleased with them. I think though, that it might be time to stop knitting myself socks - I think I've got about 8 pairs of hand-knitted socks, which in California, is probably a lifetime supply. The pattern is of course from Knitty its a surprisingly easy knit, the lace repeat was simple to memorise. The wool is Silkie from Socks that Rock, in the colour Bunny Foo Foo. The yarn is 81% merino: 19% silk, texture of the yarn is lovely, but they are unfortunately hand-wash only. 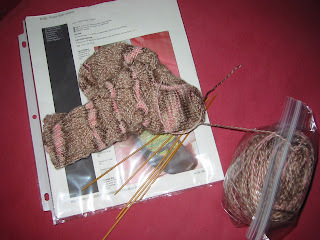 I think this pattern would really show off best in a semi-solid, but my taste seems to be for very patterned sock yarn. Today the boys did thier lemonade stand. 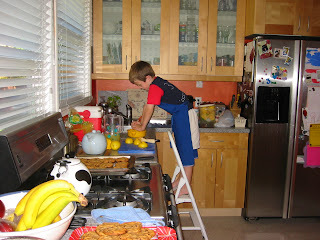 They squeezed a load of lemons, and baked cookies (from a pack). We set up the stand outside school, where the summer school is currently running. Summer school finishes at 12:15 so we were waiting at 12:00. 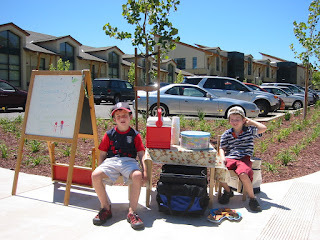 They were offering lemonade, apple juice, cookies or raisins at 25c each. They sold a gallon of lemonade and raised $21.16 for Save the Children. Finlay was a sterling barker....he kept a continuous flow of "homemade lemonade for sale, homemade cookies, all for charity"...the lollipop lady (crossing guard) gave him an extra $1 for effort! 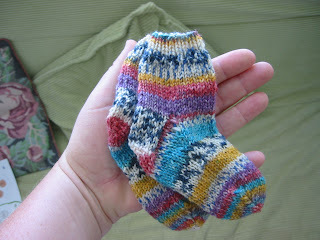 I knitted some baby socks for my neighbour's baby. Default pattern over 32 sts. Knitted in leftover wool on 2mm needles. They took one evening which is very gratifying for a quick knit. I even got the striping to match up more or less. 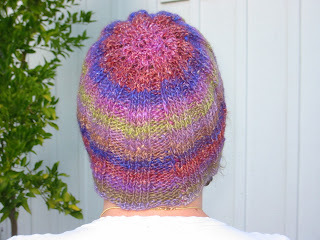 Depending on when the baby arrives, there may or may not be a matching hat (not that you need many baby hats for a summer baby in California). 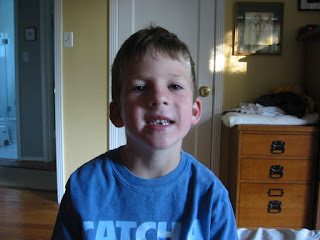 Adam lost a second tooth. this pattern. The pattern is based on a vintage smock pattern, and has an optional pocket (hence the name: Smocket), but I decided that I wanted to keep the smock completely reversible so no pockets. If I make one again I may sew the pocket first before I sew both sides together. I used fabric from my stash - some of it leftovers, some that I had been hoarding for a long time. 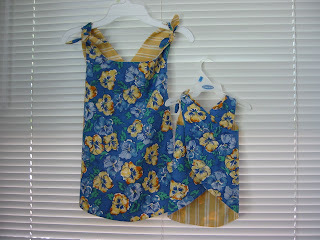 This pair of smocks are destined for Esme and Bridie, but I also made one each for Nancy and Harriet. I did persuade my 4-year old model to be measured to scale up the pattern, and to try the fit, but he absolutely refused to be photographed in the smock (even stripey side out). I don't really blame him. Apparently the average age for reading vision to deteriorate is in the mid-40s so I guess I'm spot on. 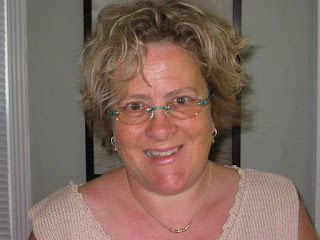 Nigel vetoed the orange glasses with diamante because I looked like Dame Edna...I was rather keen on them. I am apparently a knitting lemming: I jump on all the knitting bandwagons. Usually I jump on long after everyone else, I was knitting Clapotis and Charlotte's Web years after these patterns swept the knitting 'blogosphere'. Anyway. I'm pleased to say that this time I'm on the bandwagon along with everyone else. I'm knitting Monkey socks. In fact this is even more lemming-like because I'm knitting them because I saw Lori's socks . 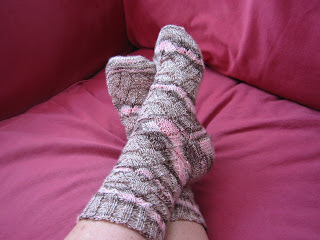 I'm even knitting in the same yarn: Socks that Rock in Little Bunny Foo Foo. The pattern is, however, really nice to knit: not too hard to remember the repeat, but complex enough to keep it interesting. In my list of favourite sweaters I had to include this one because I wanted it so badly. As often happens, the reality did not live up to my expectation. I was a victim of Rowan styling. 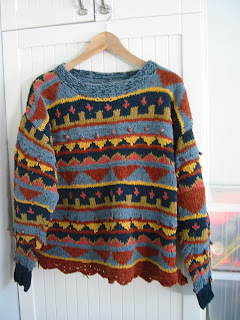 In the magazine this sweater is shown as very oversized (remember - this was the early 1990s - it was fashionable) but as the pattern was provided in one size it was not so oversized on me. It fit well enough - but not as I had imagined. I knit this in exactly the specified yarn and colours, even down to ordering the Rowan terracotta beads which mean that i cannot wash this sweater. The yarn is a Rowan Cotton Chenille - so you can imagine that it was not much fun to knit, and impossible to frog, but I soldiered on with this project to the bitter end. I dont really know why I keep it, because I am never realistically going to wear this again. I still think its a lovely sweater, the colours are so rich and they do suit me, so I'll keep it in case 1990s fashions return and I can wear it again! 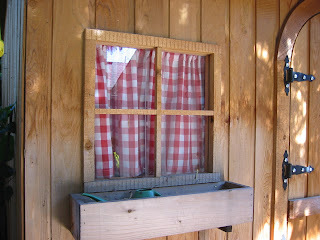 Gill suggested the curtains as I was bemoaning that the windows, while cute, allow the untidy contents of the shed to be seen from the deck. Now I need to plant something, or do something with the window boxes rather than leave my gardening gloves and watering can in them. 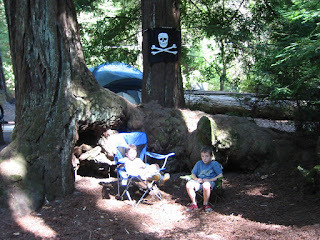 We went camping in Portola State Park this weekend. The trees there are coastal redwoods, this means they are tall rather than wide. It's very peaceful among all these tall trees, but also cold! We were rather caught by surprise by the cool temperature - it's hard to remember when it's so warm in the valley that you are going to need a fleece and a hat when camping. 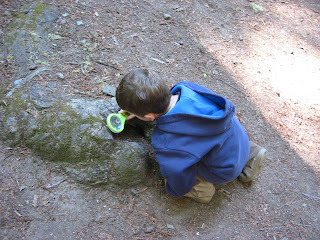 There is a small creek running through the park which is a souce of much entertainment. 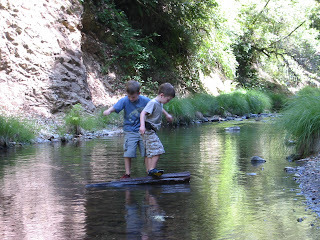 The boys were thrilled to discover a dead fish in the water, which turned out to be a steelhead trout once they described it to a park ranger. The stream is currently running very low due to our dry winter, and consequently it's too low for the spawning trout. 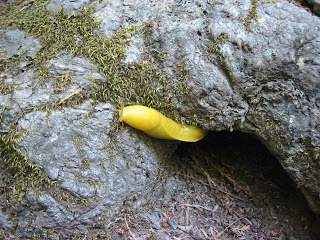 ...in this case a banana slug for which the Santa Cruz mountains are famed! These slugs are so irridescent that it's hard to imagine that they are well camoflagued, however in their habitat they look rather like the many yellow leaves that cover the forest floor.